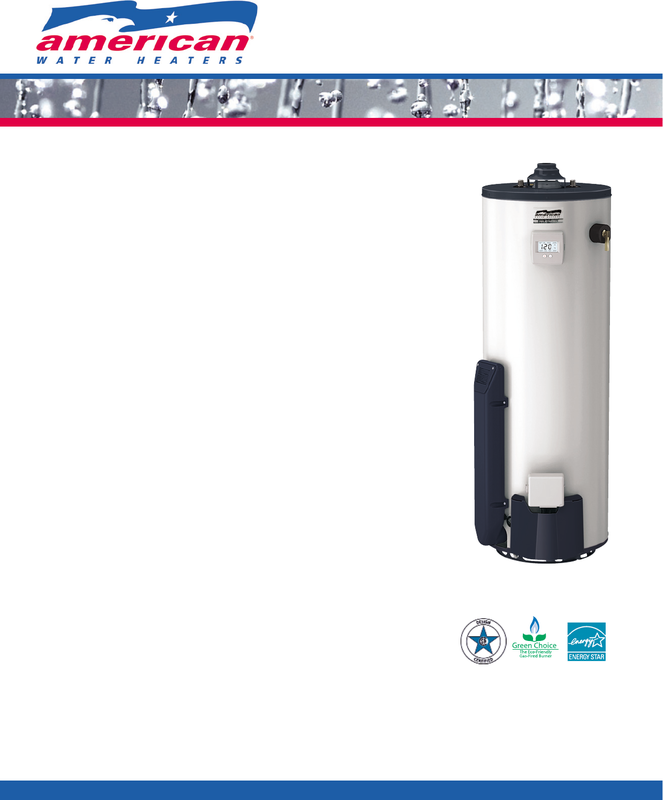 For complete warranty information consult the written warranty of American Water Heaters found at www.americanwaterheater.com, or call (800) 456-9805. Copyright© by American® Water Heaters 2008. All rights reserved. No part of this work may be reproduced or transmitted in any form or by any means, electronic or mechanical, including photocopying and recording, or by any information storage retrieval system, without permission in writing from American Water Heaters. Copyright© by American® Water Heaters 2010. All rights reserved. atmospheric gas product on the market with a .70 Energy Factor (EF). • Allows for easy replacement of standard atmospheric vent heaters. • Easily connects to existing B-vent. • Tighter dierential for more consistent hot water delivery. • The durable hot surface ignitor eliminates pilot relight issues (no standing pilot). diagnostics are in plain text. they provide exceptional performance in all water conditions. REBATE PROGRAMS, AND MEETS ENERGY STAR® REQUIREMENTS. • Helps reduce lime and sediment buildup, maximizes hot water output. • Made from long-lasting PEX cross-linked polymer. compared to standard burners and meets low NOx requirements of less than 40ng/j. • According to ANSI Z21.10.1 - 4.1 CSA Standards governing storage-type water heaters. American Water Heater is a famous company selling different equipment like communications. Our team collected 53 free handbooks created by this brand . Now you're reading a user guide for American Water Heater Amplified Phone NRGSS01010.